Part 2--Touring Sonoma Wine Road: There's No Place Like Home! Wine tourism is about more than wine, it's the food, the lodging and the people of a region that make it a complete experience. I live smack dab in the middle of one of the greatest wine regions in the world, and sometimes it's easy to take it for granted. Luckily I got a chance to see some places I was missing and gain a new appreciation for what's right outside my door. On Day 2 of the Wine Road tour I met up with everyone for lunch at Corks Restaurant at Russian River Vineyards. I live less than 5 miles from the restaurant and I walk by several times a week on the trail that runs behind the vineyard, yet-- (repeat after me)-- I’d never been there! 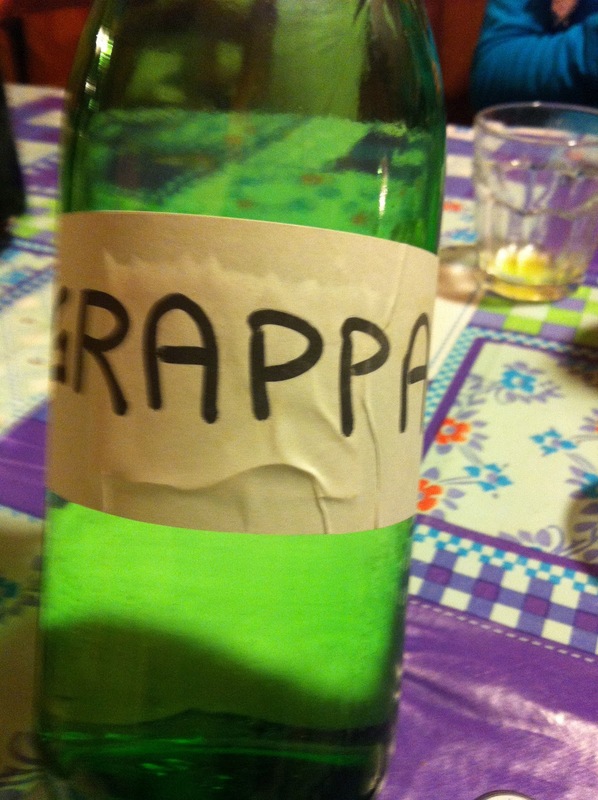 I had to laugh when our host asked who would like some wine to start and no one replied. She set down the wine list and said order anything you like. Well, as the designated wine blogger I felt it was my duty to order wine for the table. 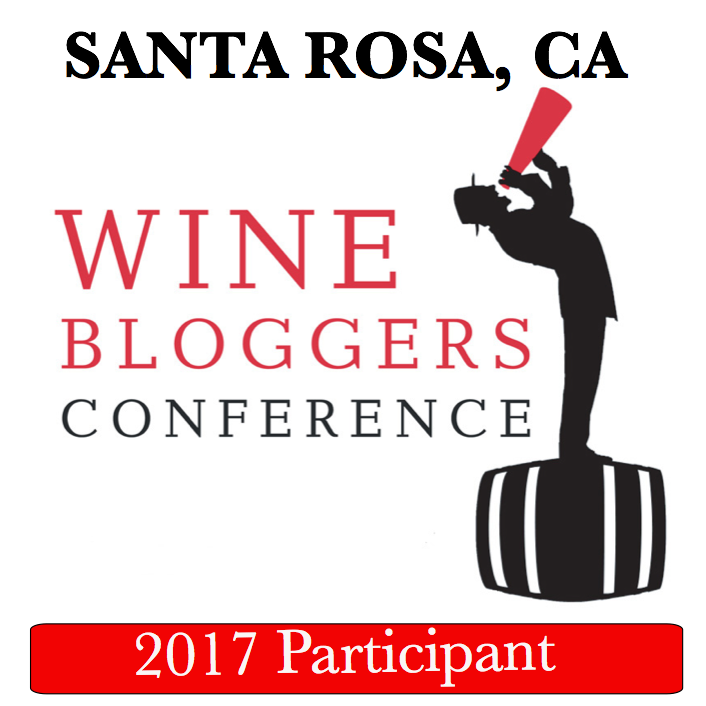 I dare say for many of the bloggers, the amount of wine they were tasting over the course of three days was way more than usual. 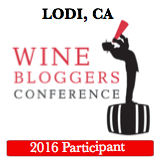 That’s one difference between the food blogger world and the wine blogger world-- I’m positive a group of wine bloggers would never be given free reign of the wine list! There are some beautiful (and expensive) wine’s on the list at Corks--but I kept it modest and chose a lively Atascadero Creek '10 Sauvignon Blanc and a 2009 Charbono from Russian River Vineyards. I personally love Charbono and you rarely see it on wine lists. During the meal we also tasted several of the selections from the Corks tasting room which they poured for us tableside. 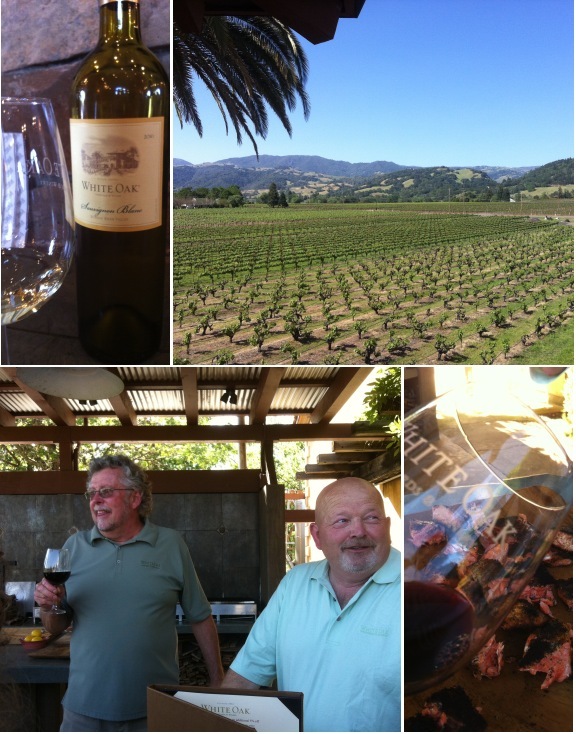 After Corks, it was on to Paradise Ridge Winery for a round of speed tastings with winery representatives and winemakers. This was not like the wine speed tastings I’ve participated in before at Wine Bloggers Conference where bloggers sit a tables of 10 and the wineries go from table to table and pour. Instead, this tasting was more like a true speed dating set up, where each winemaker or representative sat at a single table and we did a musical chairs, round robin, and met for eight minutes with each person one-on-one. This was similar to the timed meetings at travel media conferences where you spend 10-15 minutes with each tourism rep. 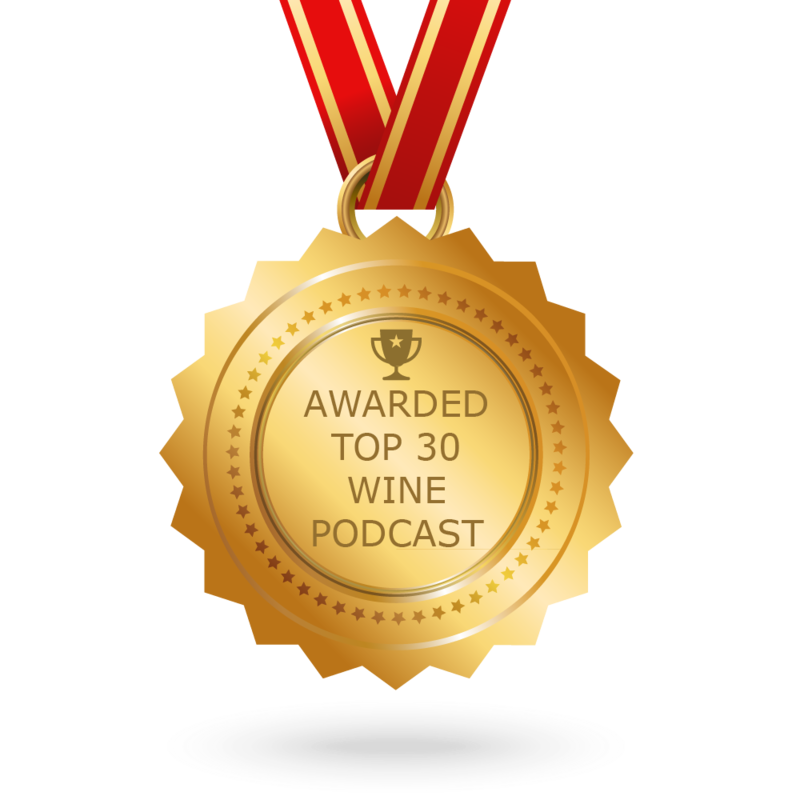 I really liked this format for wine, as you got to interact with the winemaker on a much more meaningful level and had time to taste the wine without a rush. I knew more than half of the folks pouring, but it was fun to see old friends and participate in the speed tasting. 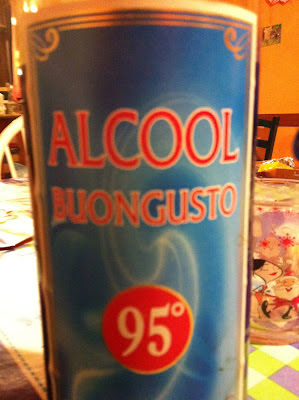 New to me wines were: Amorosa Bella Wines, Calluna, West Wines, and Dutcher Crossing. No one was engaged at the end of the "speed dating" session, but I was very impressed by the few bloggers that were not used to tasting through so much wine-- they were real troopers. As any wine blogger knows, a wine press trip can be grueling in terms of the amount of wines you taste. And it’s truly hard work to taste and make notes and keep it all together wine after wine after wine. I missed Day 3 of the tour around Dry Creek which included many of my favorite wineries including Quivira, but I was honored to be the lone wine blogger on board and hope to meet up with my new food and travel friends again very soon. Thanks so much to Beth and Tracy from the Wine Road and Marla from Wagstaff for a well organized and informative event that even this slightly jaded local found to be full of surprises and great discoveries in my own backyard. I promise not to take it for granted ever again! For an excellent round up of the event and beautiful photos check out Stacie Tamaki’s blog The Flirty Guide here. 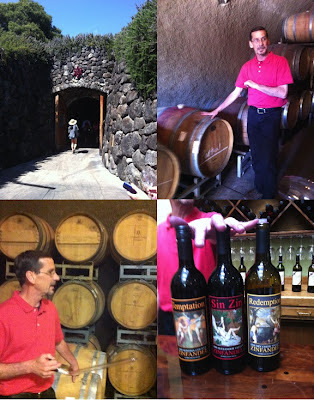 Touring the Sonoma Wine Road: There’s No Place Like Home! Two weeks ago I had the pleasure of joining a three-day a press trip sponsored by the Wine Road of Northern Sonoma County. I was in the middle of a book deadline so, I could not participate in the entire three days, but since the tour took place practically in my own backyard, I was able to I pop in and out and meet the group around the area. First off, I have to say what a great group it was (see Stacie Tamaki's list of participants here). I’m used to hanging out with travel writers and wine bloggers, but food bloggers are completely delightful in the most amazing ways. I should have known this already as I have a great friend who is a hybrid food/travel blogger and photographer-- and she is one of the coolest people I know. 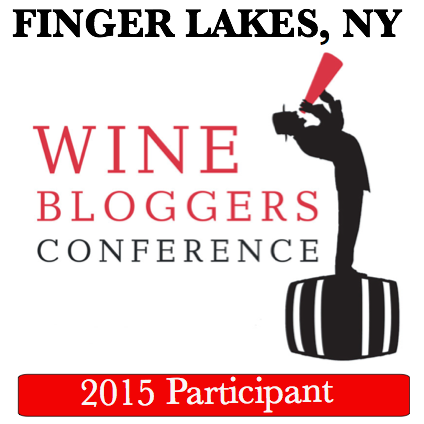 Food bloggers talk about completely different things than wine bloggers, (go figure) and they seem to have much better industry gossip too! Plus they are very well read--especially esoteric food mags named after fortuitous fruits. One in our group, Anita Chu is launching her own food themed magazine called Sated and I can’t wait to read it. I learned all sorts of things from the other participants and I could not have enjoyed myself more than if I hand picked the group myself. 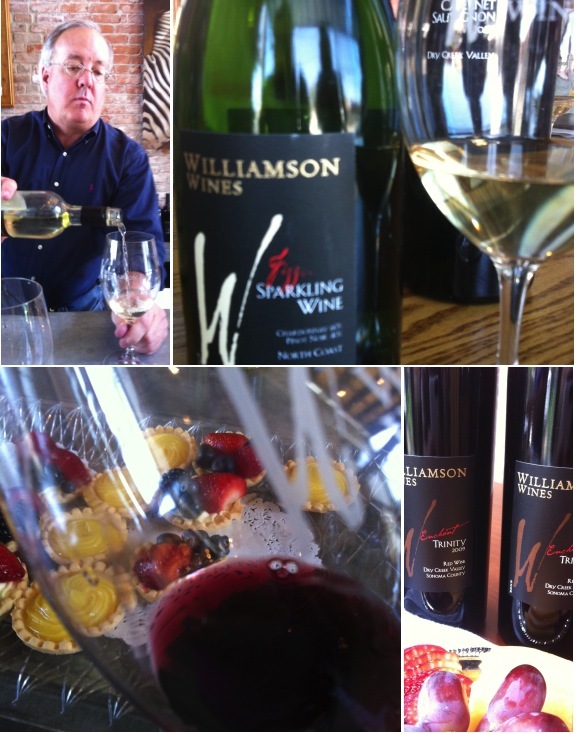 The first stop of day one was in Geyserville at Williamson Wines. I'd never tasted their wines before and the visit was off to a great start when we were greeted by Jeff Hall and Dawn Williamson and handed glasses of “Fizz” their North Coast Sparkling wine made from 60% Chardonnay and 40% Pinot Noir. I found the Fizz peachy and toasty with good acidity--a very easy sipper. Dawn Williamson hosted us on their back patio for a light lunch along with a selection of their Bordeaux and Rhone style wines including Entice Cuvee a red blend, Elate Grange Cuvee and Enchant Trinity GSM that was my favorite. After lunch we tried a few more wines in the tasting room including the Frolic Viognier with some curried cashews. The cashews, while interesting on their own, interfered with my enjoyment of the viognier, which was just great alone. 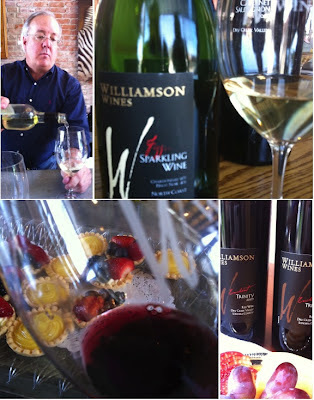 Williamson Wines firmly believes wines that are meant to be enjoyed with food and the tasting room offers food and wine pairings by appointment. Call and go. On to Alexander Valley to the eponymous named Alexander Valley Vineyards-- At Alexander Valley Vineyards we took a tour of the caves with Scott Mansfield where we tasted some barrel samples and compared the wines in French oak and American barrels. 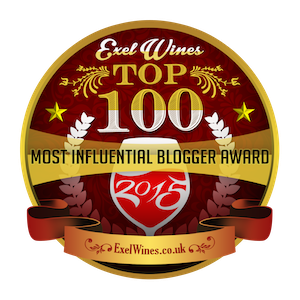 I’m well acquainted with the wines from Alexander Valley Vineyards but I’d never been to the winery and it was fun to hear the opinions of the other bloggers, a few who had never tasted barrel samples before. Next we drove over to White Oak another winery where I was familiar with their wines, but, you guessed it…I’ve never been there! The main building hosts the tasting room along with an upstairs room offering stunning views of the valley. When you visit, keep your eye out for a super weird but oddly adorable brontosaurus covered in dried beans, that looks like it just stepped straight off a Pasadena Rose parade float. Out on the patio we chatted with winemaker Bill Parker while White Oak owner Bill Myer prepared some fresh caught salmon for us. A hunter at heart, Bill Myer seems to be on the hunt for the best wine he can make as well as a few trophy fish. 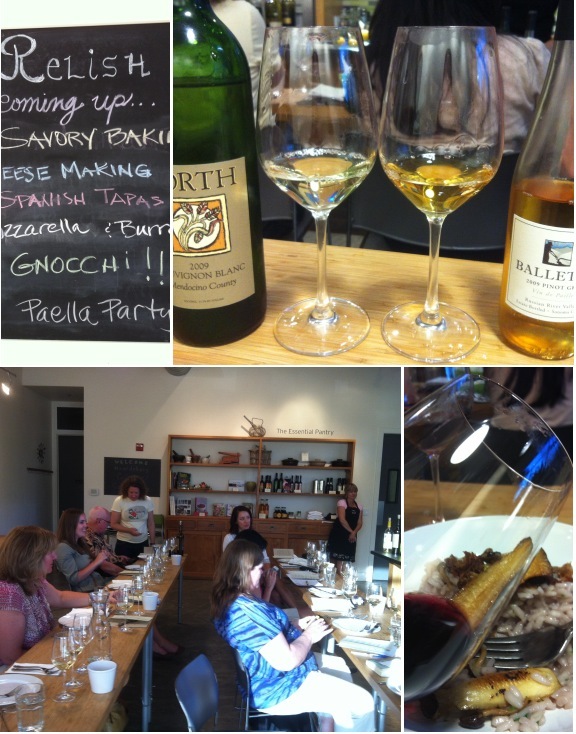 Our last stop of day one was at Relish Culinary Adventures in Healdsburg. Of course I know of Relish and have been to many events they’ve catered, but I’d never been to their home base where they host private events and have a fully equipped demonstration kitchen. 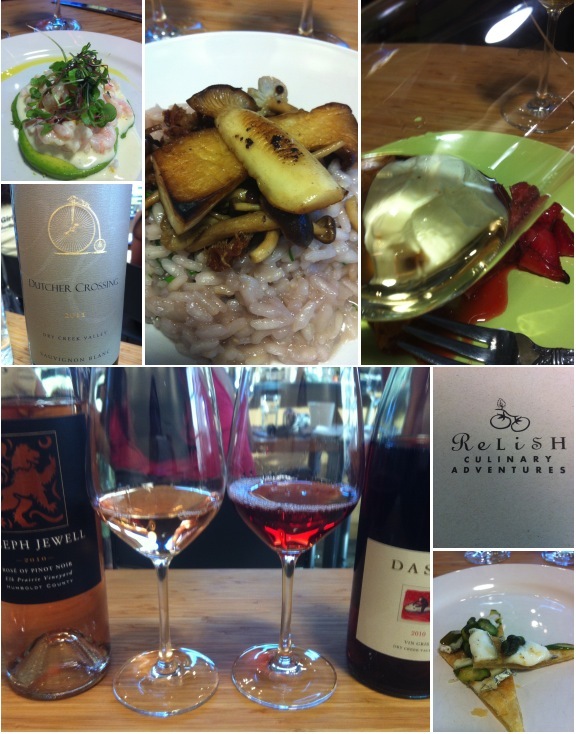 Owner Donna del Rey greeted us with glasses of 2011 Michel-Schlumberger Pinot Blanc and gave us a brief overview of what Relish is all about and then turned us over to Chef Ciara Meaney who guided us through four courses, each paired with two wines for us to contrast and compare. 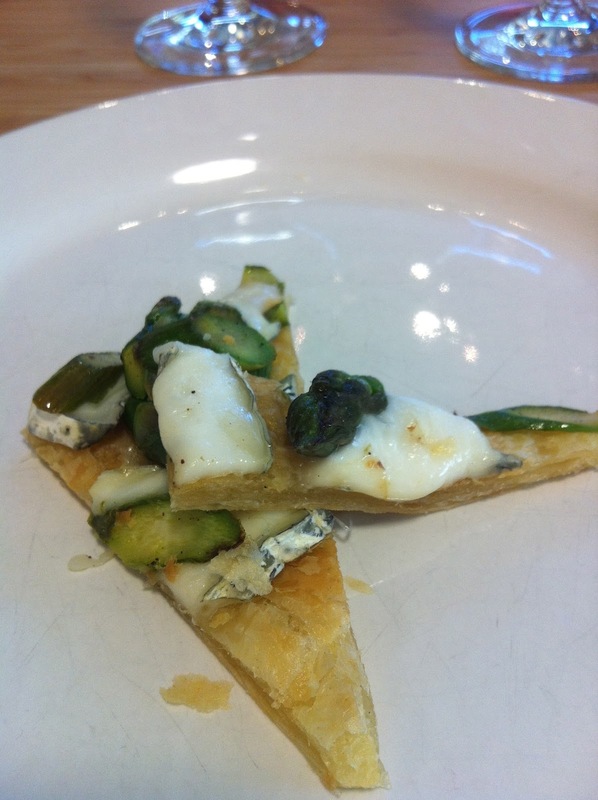 We began with a goat cheese and asparagus tartlet paired with a Sauvignon Blanc and a Dry Riesling. I really don’t understand all the wine-paring professionals out there that claim asparagus can’t be paired with wine--that's ridiculous. 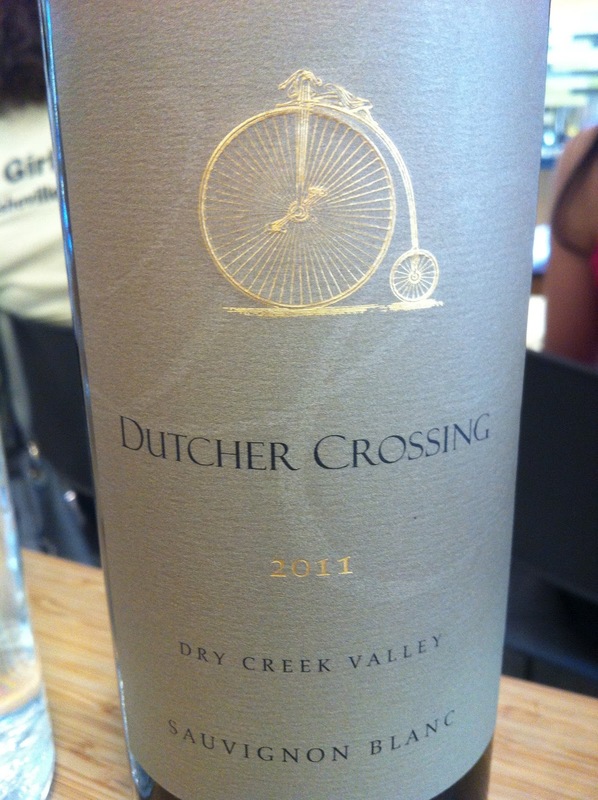 There are plenty of wines that go great with asparagus and Dutcher Crossing Sauvignon Blanc is one of them. As the meal progressed our place settings got a bit crowded with all the wine glasses and I had to give my fellow writers some good natured ribbing when a few in the front row knocked their glasses off the narrow tables. I’m sure I could have done the same, especially when taking photos with my phone. It always looks like there is more room at the edge of the frame. Anyway, all the smashing glass added to a jovial atmosphere-- Oopla! Well maybe not for the people cleaning it up. Rock Shrimp and Avocado Salad with Lemon Aioli and Baby greens--Paired with Dashe Cellars Vin Gris, Grenache Rose and Cellars of Sonoma Joseph Jewel Pinot Rose. 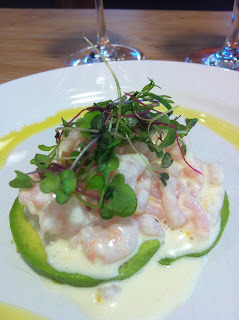 My preference in this pairing goes to the Dashe which I felt supported the lemony quality of the dish best. Crispy Duck and Wild Mushroom Risotto paired with Philip Staley Vino Tinto and Amista Vineyards Syrah. 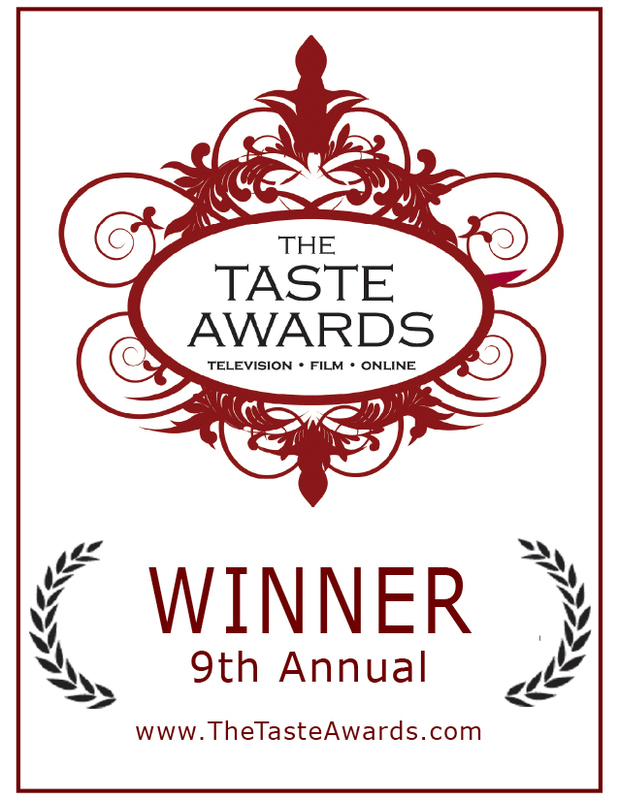 --Hands down winner was the Syrah here which for me was perfect play with the savory and fatty aspects of the duck. 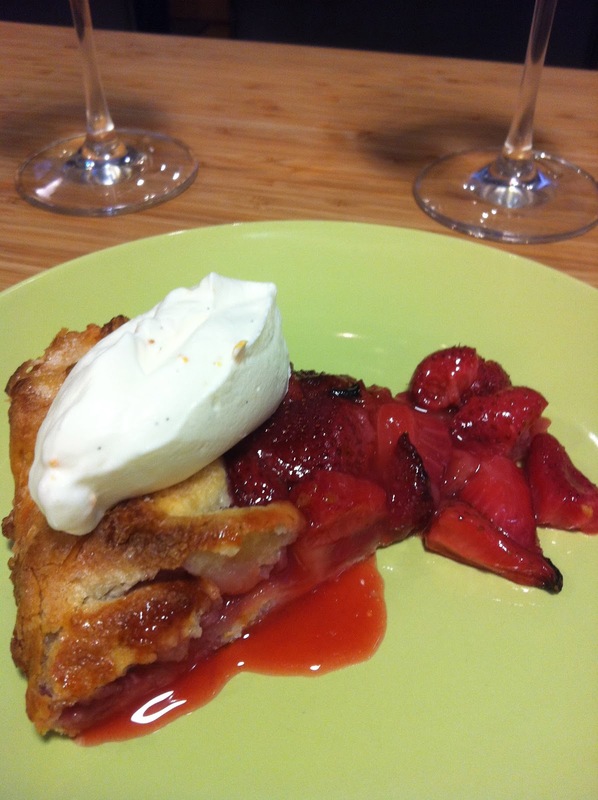 Strawberry and Rhubarb Galette paired with Forth Vineyards Late Harvest Sauvignon Blanc and Balletto Vineyards Vin de Paille. Both of these were great with this incredible dessert but my palate leaned towards the Balletto Pinot Gris which was just amazing and concentrated with rich flavors of pear and honey and wonderfully sweet without being cloying. On April 30th Frank Dietrich of Blue Danbue Wine hosted yet another great evening of wine and food at Bar Tartine in the San Francisco Mission featuring Austrian wines from Axel and Herta Stieglmar of Juris Winery. Normally, the first wine that comes to mind when I think of Austria is Grüner Veltliner, the mineral forward, bright spicy and citrus white wine that is grown in much of the vineyards--not Pinot. But the featured Juris wines were Pinot and St. Laurent, also known as Sankt Laurent which is a variety in the same family as Pinot Noir, originating in France, and a grape that was new to me. Axel's father Georg was captivated by the wines of Burgundy and he began to cultivate Pinot and St. Laurent in the 1960's. 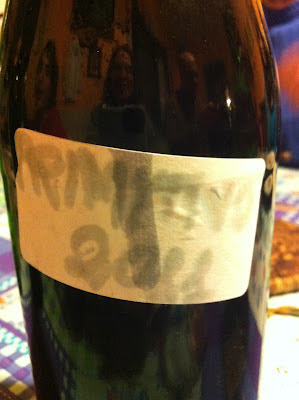 Now Axel has continued the line and from what I tasted I 'd say it's a worthy endeavor. The initial line up of wine included the JURIS 2009 Pinot Noir and 2005 Reserve Pinot Noir as well as the 2009 St. Laurent, Reserve and the 2006 St. Laurent Reserve. I preferred the 09 JURIS Pinot over the 09 St. Laurent’s which I found to be fuller on the nose but thinner on the palate. Alex and Herta personally poured the 02 St. Laurent, Reserve and a vertical line of St. Laurent’s from 05 to 09. I liked the 05 St. Laurent very much a powerful balance of fruit and earthy funk that I appreciate. Nicolaus Balla and Cortney Burns chefs at Bar Tartine provided some excellent Austrian/Hungarian themed bites to pair with the wines and unfortunately I have no idea what most of them were called, so I made up my own names for the dishes including: Yum with meatballs, Yum on dark brown bread with radishes (that was exceptional), Yum in a shot glass, and Major Yum fried bread with some type of sour cream concoction. I saw lots of tantalizing looking items on other people’s plates too, but it was difficult to get access into the bar to try them all. The down side of being small in stature is I lack a boarding house reach when it counts. The event was lively and crowded and then around 9pm a minor riot broke out when Frank brought out some BIBICh wines to sample. No, seriously, the BIBICh did not cause a riot, but the timing was uncanny, as out in the street a group of protesters clad in black marched down Valencia street wreaking havoc shooting paint balls, vandalizing cars and smashing windows. 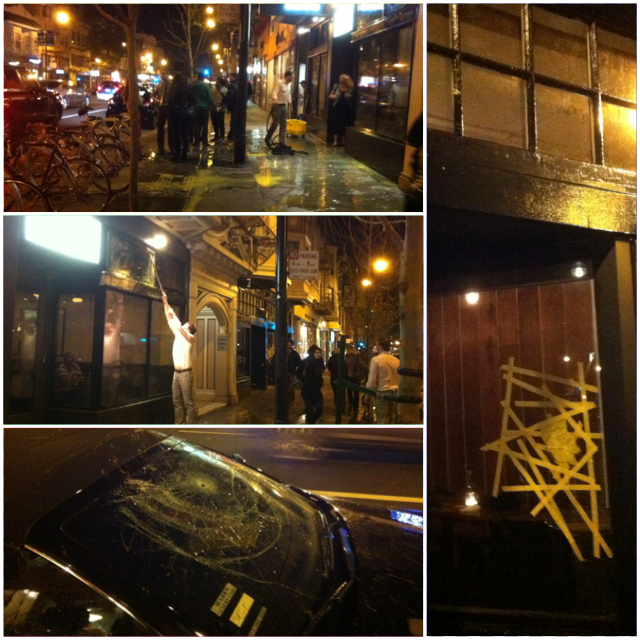 The front window of the restaurant was smashed and the energy inside hushed as we all turned our attention to the scene. Next thing we know the riot police were mobilized and marching down the street as well. It was surreal to say the least. And I’m not ashamed to say my first instinct was to take the bottles of BIBICh Frank had opened as a special treat, and hide in the kitchen. You know, just as a precautionary measure, to… ahem…protect the wine. Eventually things on the street calmed down but the aftermath scene was surreal. Broken glass, yellow and red paint running down the facades of businesses as workers tried to wash the paint off, cars smashed and spray painted with anarchy symbols. I could only imagine what Axel and Herta thought about all this. Welcome to America! Unfortunately in the hubbub of it all I lost my tasting notes on the other St. Laurent’s that I’d written on the info sheet. But the 05 was the standout for me. Special thanks to Frank for keeping me on his mailing list.